The 44 metre Heesen motor yacht Jems is offering a new low season charter rate of €140,000 per week, down by €20,000, through Y.CO. 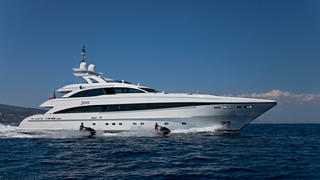 In addition, she is offering a special rate of €125,000 per week during June for late bookings in the west Med. Accommodation in a neutral, light- filled interior is for 10 guests in five cabins consisting of three doubles and two twins, all with state of the art entertainment centres, television screens and en suite bathroom facilities. One of the twins can easily be converted into a double if required. The entire yacht is geared towards relaxation and enjoyment with a large saloon fitted with comfortable furniture including large settees to port and starboard, occasional armchairs, a bar and an entertainment centre, while the vast aft deck has a large table offering al fresco dining with seating for 10 guests. The sun deck of this yacht for charter comes complete with a Jacuzzi tub, wet bar, sun loungers and a marvelous large screen outdoor cinema. Additional features include a media room and gym, and there is WiFi internet access throughout. A pair of powerful diesel engines give her a comfortable cruising speed of 20 knots, a range of 1,000 nautical miles and she is fitted with zero speed stabilizers to eliminate roll motion at sea and in port. A huge range of water toys includes a tender, two Yamaha jet skis, windsurfers, snorkeling gear, kayaks, scuba diving equipment and an array of towables, including water skis.